Cheaper – Over the life of a bread machine you will save money over buying store-bought bread. Better Tasting – You can prepare any type of bread including artisan loafs which will be much more fresh than anything you can buy. Healthier – You control the ingredients you add, so you won’t have any additives or preservatives. When shopping for a bread maker you obviously want one that consistently bakes great tasting bread. Some other features to look for include pre-programmed bread cycles (at a minimum a normal cycle and dough cycle), quiet operation, simple intuitive controls, size of the machine (a 1-pound loaf yields about 8 slices while a 2.5 lb loaf yields about 20), add-ingredient signal for nuts or raisins, delay timer so you can wake up to freshly made bread, easy to clean, and specialty options or settings like for gluten-free. Pricing ranges from about $50 to $300 for the best models. Below we review our top picks for the best bread machines. 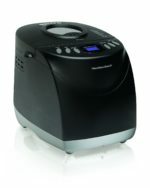 Simply put if you want the best bread machine you can buy go with the Zojirushi BB-PAC20 Virtuoso. While it does cost about $299, it is also the highest rated model available on Amazon with a 4.5 star overall rating. The Virtuoso has an extra heating element on top compared to the very similar Zojirushi BB-CEC20 Supreme which ensures perfect crust every time from 3 different crust shade selections. Some other features that come with this model include 10 preset bake options including gluten-free, handles up to a 2 pound loaf, 13 hour delay timer and has 2 kneading blades. We highly recommend this Zojirushi model – there really are no negatives except the price, so just be aware that there are cheaper options available if price is a concern for you. For around $265 you can buy the Zojirushi BB-CEC20 Home Bakery Supreme which produces nearly the same results as our top choice. It has almost all the same features as the Zojirushi Virtuoso except for the additional heating element on top. This thing is versatile, highly programmable, and makes a great 2 pound horizontal loaf of bread. We highly recommend the BB-CEC20, although for a few more dollars you could get the BB-PAC20. There are also options available that are much cheaper as well. 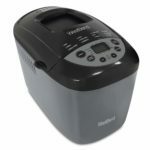 If you don’t need a 2 pound bread maker you might want to consider the Zojirushi BB-HAC10 Home Bakery 1-Pound model available for about $199. This thing is perfect for those of you living alone or couples where a 1 pound loaf is the ideal size and still want amazing fresh bread. It has several different settings and controls including 3 bread textures, cookie/pasta dough setting, french bread, cake, jam, and quick bread. It also has a non-stick kneading blade and pan, 13 hour delay timer, and a window to keep an eye on the baking process. 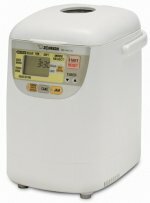 If you want a small bread maker then we highly recommend this Zojirushi BB-HAC10. Perhaps the ‘smartest’ and most user-friendly bread machine available is the $250 Breville BBM800XL Custom Loaf Bread Maker. The nicest feature it has is an automatic fruit and nut dispenser that releases ingredients at just the right time during the kneading phase. This is a great and welcome addition for anyone who likes to make bread with fruit or nuts as ingredients. The Breville BBM800XL has a smart LCD screen displaying the 13 automatic settings, 3 crust colors, and 4 loaf sizes between 1 and 2.5 lbs. It also has a beautiful stainless steel design for those of you into the appearance of appliances on your counter. The quality of bread it bakes is quite good, maybe just a touch below Zojirushi and one common complaint is that the top does not get as brown as the sides and bottom of the loaf. If you need a bread machine capable of making larger loaves then the new West Bend 47413 might be for you. Selling for about $136 this bread maker had 3 loaf sizes up to 3 lbs. The quality is good, but does not quite compare to the top-tier models that Zojirushi makes. Other features on this West Bend model include 12 digital settings, 3 levels of crust control (light, medium, dark), and 13 hour delay timer. The Cuisinart CBK-200 is a good option for those looking for a gluten-free model. Costing about $145 this attractive stainless steel appliance comes with 16 preset menu choices, 3 crust colors, 3 loaf sizes up to 2 pounds, and 12 hour delay timer. We found this one to be a little bit more finicky when trying to produce consistent results, but once dialed in it makes quality bread. With a price of just above $100 the T-fal PF311E is a good starter machine for anyone not ready or willing to make a big investment. It kneads well and bakes evenly. The loaves it bakes are of good quality, but they come out oddly shaped – taller than they are long. 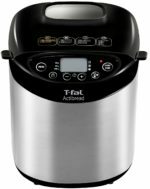 This T-fal bread maker has 15 settings including 3 different gluten free settings. It also has 3 loaf sizes (1, 1.5, or 2 lbs), 3 crust settings, and 15 hour delay timer. 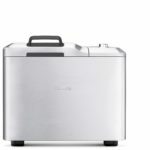 If you are searching for a bread maker for under $50 the the Hamilton Beach 29882 is the perfect choice for you since it sells for around $48. While not perfect, this model still received high ratings from most users with many complimenting how well it makes gluten free breads. Some other features include 12 settings, 1.5 or 2 pound loaf settings, 3 crust settings, and large digital display with delay timer. We recommend the Hamilton Beach 29882 Bread Maker for anyone who wants a cheap bread machine that still gets the job done.